Tempos Interessantes: Threat or Bluff? The year started with a Bang! Literally. A nuclear bang to be more precise. On 6th January, North Korea conducted her 4th nuclear test. The previous ones took place in 2006, 2009 and 2013. This is NOT the North Korean nuclear test. It is an American nuclear test at the Bikini Atoll. Most of the “day after” talk was about the nature of the blast. 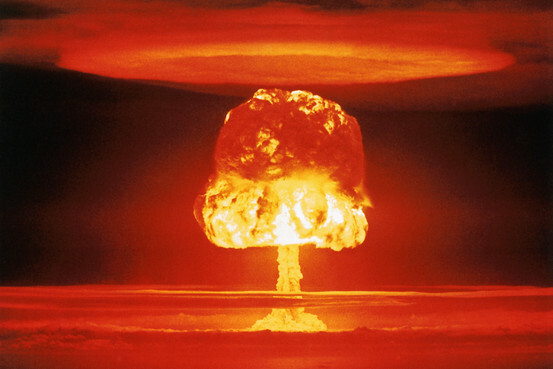 Was it a hydrogen bomb like Pyongyang claimed? Was it just another atomic explosion like the seismic readings seemed to indicate? Was it a middle-of-the-road boosted-fissile device like several experts suggested? The nature of the device is very important. If it was a thermonuclear bomb, that would represent a major qualitative development of North Korean capabilities. That does not seem to be the case. Not yet. 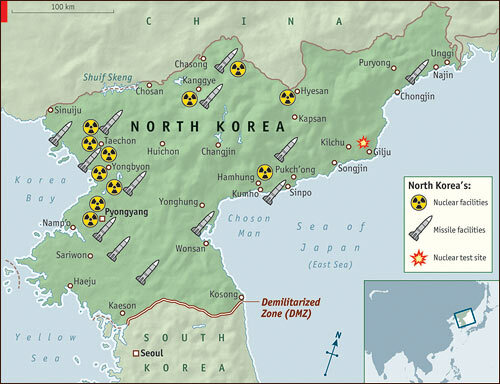 North Korea’s Nuclear and Missile facilities and her nuclear test site. In two words, Bargaining and Leverage. North Korea is a relatively small country: the 51st most populated in the world (25.000.000 people), the 99th largest (120.000 km2); the 112th economy (GDP of US$ 40 billion). However, over the last quarter century, North Korea has been sitting at the negotiating table with a sample of the world’s biggest non-European powers: United States, Russia, Japan, China and South Korea. This is an outstanding an unparalleled feat. No other country of a comparative dimension has achieved this kind of status. The DPRK (Democratic People’s Republic of Korea) did it! And this was mostly due to nuclear weapons. That is the DPRK’s leverage: it drags the great powers to negotiate and it is the bargaining chip. North Korea tries to get payoffs (money, oil, food, investment, aid, recognition) in exchange for concessions on her nuclear programme. However, Pyongyang eventually reneges the concessions and the game is back to square one. Going back to the student’s question, the answer for him, who lives in Portugal, is “No”. Even for North Korea’s neighbours, the answer would be “a bit, not much”. As I said, nuclear weapons are North Korea’s life insurance. This means that Pyongyang will only use them as a last resort desperate measure, if the regime is about to collapse due to foreign attack or interference. Kim Jong Un knows that the minute his country launches a nuclear attack his regime will be annihilated immediately afterward in a devastating counter-attack. North Korea will not use nuclear weapons unless it is pushed to a life or death situation. North Korea will not relinquish her nuclear weapons, because that would make the regime much more vulnerable and could bring its downfall. North Korea’s nukes are both a threat and a bluff. The bombs are real, so the threat is real. But the bluff is real too, because the use of the nukes would lead to the end of the DPRK. So, the DPRK will continue her exercise of balancing threat and bluff for as long as possible. The best course for the 5 powers is to let the balancing act to go on, because the moment the threat materialises itself and the bluff is over, there will be war. A very good and clear explanation, so very well understood. Overall, I hope it countinues a bluff.